Erythrocruorin, a giant hemoglobin from earthworms. Hemoglobin comes in many shapes and sizes. In our blood, a hemoglobin with four chains carries oxygen from the lungs to cells throughout the body. Some plants build a single-chain hemoglobin to help protect sensitive nitrogen-fixing bacteria from oxygen, similar to the single chain myoglobin that stores oxygen in our muscle cells. Some bacteria also make simple forms of hemoglobin to help manage oxygen and other small molecules. Earthworms, however, are the champions when it comes to building huge hemoglobins. They, and a few other types of invertebrate animals, build enormous complexes of hemoglobin to carry their oxygen, termed erythrocruorins. 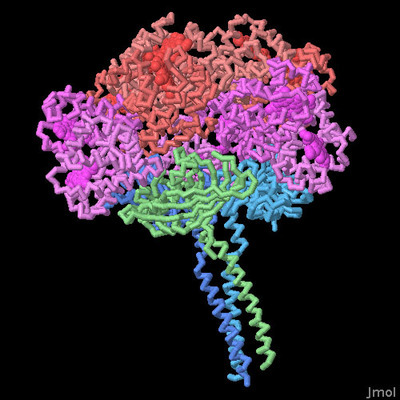 The erythrocruorin made by earthworms is enormous (PDB entry 2gtl ). 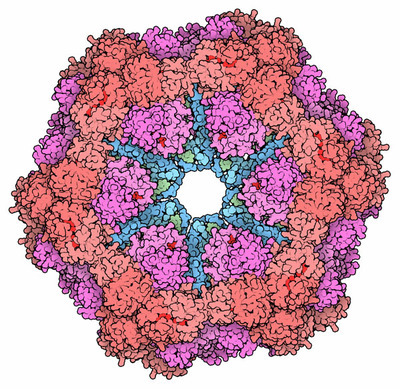 It is built of 144 separate globin chains, each with its own heme group to carry oxygen. These globin chains come in four similar types (36 copies of each, shown here in pink and purple), similar to the slightly different alpha and beta chains that are found in our own hemoglobin. Then, 36 linker protein chains (shown here in blue and green) stitch all the globin chains together into one big complex. There are several possible functional reasons why the earthworm erythrocruorin needs to be so large. First, it is not packaged safely inside a blood cell, like our hemoglobin is. Instead, it floats freely in the liquid that flows through their vascular system, and the large size may help reduce leakage of hemoglobin. Also, these complex erythrocruorins allow lots of opportunities for interaction between subunits, and compared to our hemoglobin, they show even more cooperativity in binding and release of oxygen. Finally, huge complexes like this are a way to pack a lot of functional sites into one particle, which can help keep the viscosity of the solution manageable while having a high concentration of sites. Hemoglobin diversity: earthworm (top), tube worm (bottom left), and human (bottom right). The huge earthworm erythrocruorin, and the smaller human hemoglobin shown here at the bottom right (PDB entry 2hhb ), are used primarily to transport oxygen. 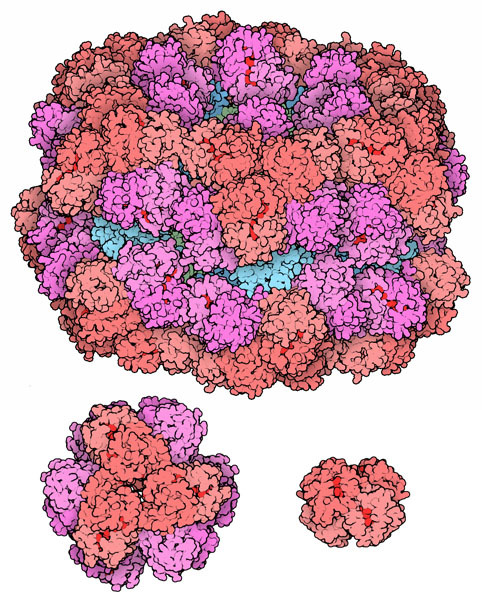 The large hemoglobin made by tubeworms living near hydrothermal vents, shown here at bottom left (PDB entry 1yhu ), has a more complex function. They have endosymbiotic bacteria living in their bodies, that oxidize sulfides to generate energy. The worm's hemoglobin has evolved to transport oxygen for the worm, but also transports sulfides for the bacteria at the same time. Structures of erythrocruorin and other giant hemoglobins reveal that they are built with a similar hierarchical structure. The basic unit is composed of 12 hemoglobin chains, which associate into 6 dimers, which are then assembled into a hollow shell with three-fold symmetry. In the tubeworm hemoglobins, two of these shells come together to form the spherical complex. In the larger earthworm erythrocruorin, three linker chains are inserted in the shell. The linker chains have a long helical portion that associates into a trimer, and globular head group that holds onto the twelve globin chains. This functional assembly--a trimer of linker chains and a dozen globins--is termed a protomer. The entire complex is built of 12 of these protomers. To take a closer look at this protomer, and the many disulfide bonds that help to hold it together, click on the image for an interactive Jmol. The globin chains in these giant hemoglobins are very similar to our own hemoglobin and myoglobin. You can compare these using the Structure Comparison tool at the RCSB PDB. The interaction between the subunits in erythrocruorins, and many other smaller hemoglobins from mollusks, echinoderms and segmented worms, is quite different than the arrangement in our hemoglobins. Compare the structures, and notice that the invertebrate hemoglobins often associate with the hemes of neighboring chains in close proximity. W. E. Royer Jr., H. Sharma, K. Strand, J. E. Knapp & B. Bhyravbhatia (2006) Lumbricus erythrocruorin at 3.5 A resolution: architecture of a megadalton respiratory complex. Structure 14, 1167-1177. M. L. Hackert & A. F. Riggs (2006) When size matters. Structure 14, 1094-1096. W. E. Royer Jr., H. Zhu, T. A. Gorr, J. F. Flores & J. E. Knapp (2005) Allosteric hemoglobin assembly: diversity and similarity. Journal of Biological Chemistry 280, 27477-27480. R. E. Weber & S. N. Vinogradov (2001) Nonvertebrate hemoglobins: functions and molecular adaptations. Physiological Reviews 81, 569-628.